Articles Anthony Joshua – Size Matters? 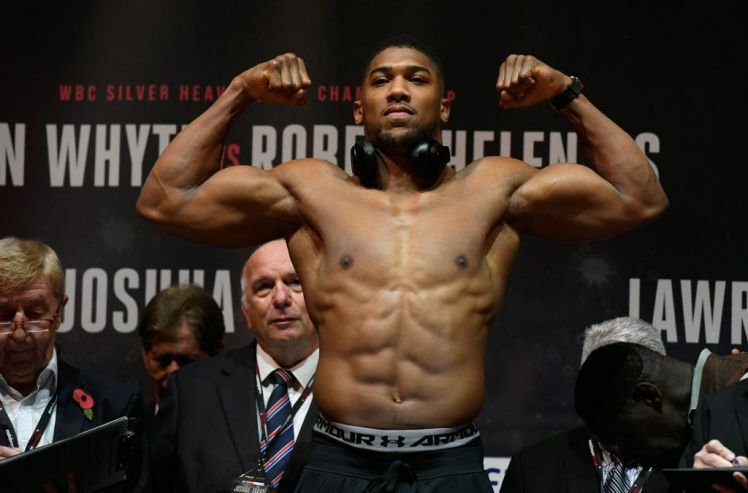 Anthony Joshua – Size Matters? AJ increased his body mass by 2% in two years, whereas Canelo increased by 4% to step up to the Middleweight division. In his last three fights, AJ threw on average 41 punches per round and landed 17. A success rate of 40.8%, the average heavyweight lands 34% of their punches. After his performances against Klitschko and Takam, Anthony Joshua’s fighting weight has been under the media microscope. “Too big”, “Too heavy”, and “Sluggish”. For the Takam fight Joshua tipped the scales at 254 lbs (18 st 2lbs and 115.2 kg for you scientists); this is 24 lbs heavier than his debut four years previous. This seems like a big jump in weight to non-athletes, or even ‘normal’ boxers who have to manage every ounce to make weight. But, for the big guys, a significant weight gain is sometimes necessary; especially those with the desire to be heavyweight king. For fans and members of the media, it’s very easy to start making claims of AJ being ‘too big’. However, we know that there is much more to meet the eye when discussing elite-level sport. At Boxing Science, it’s our job to dissect, analyse, explain and provide solutions for our athletes. We’ve analysed stars such as Canelo, Golovkin, McGregor, Mayweather and much more, not to mention our special ‘Science Behind’ the big fights. First of all… Are people being harsh? Many fighters increase weight as their career progresses. For example, Saul ‘Canelo’ Alvarez has stepped up to Middleweight recently, increasing his fighting weight by 4%. But Canelo seemed to struggle with the pace during the middle rounds in his fight with Golovkin and ended up drawing the fight. Then you have Conor McGregor who last year was exhausted against Nate Diaz after a 25 lbs increasein body mass. It’s easy to make the association between boxers ‘gassing out’ and their increased weight. But is it a valid one? First, let’s consider the so-called weight ‘issue’. Anthony Joshua has increased his weight by only 2% since facing Gary Cornish for the Commonwealth title in 2015. It represents Joshua’s pre-fight weight for his first 20 opponents as well as 5 hypothetical future opponents. The blue bars represent AJ’s weight and orange bars his opponents. The lines are trend lines that indicate the general course of his weight over the first 20 fights (and extended to 5 potential future opponents). The blue line is AJ’s and the orange is his opponents. Underneath the first graph is a second that depicts the difference in weight. A positive value indicates that AJ was (or probably will be) heavier than his opponent. Note: We swapped Takam’s body mass with Pulev as AJ was preparing for him – much bigger and heavier than Takam. We’ve also added potential future opponents – includes Parker (WBO), Wilder (WBC), Fury (Ring Magazine), Ortiz (WBA mandatory) and US prospect Jarrell Miller. What does this graph suggest? Although we’ve extended the trend-line to 5 future opponents, it highlights how AJ’s and his opponent’s weight have increased and will increase at a similar rate. It clearly demonstrates the need for him to increase his weight as he stepped up to world level and prepares to dominate over the next few years. Boxing Science Starter Pack – For Just £5!!! Kickstart your sport science journey for just £5! But how does this compare with previous heavyweight champs? Joshua’s body mass is increasing at a rate similar to his opponents. However, how quick is this change? One way to find out is to dissect the weight change of champions from the past. We’ve investigated the weight of Riddick Bowe, Lennox Lewis and the Klitschko brothers (Wladimir and Vitali) during their first 20 professional bouts. The only notable performance of the legends in their first 20 fights was a European title win by Vitali Klitschko. In other words, AJ’s stepped up to world level very quickly compared to the others. Joshua was lighter than his future champion opponents when he turned pro, and because he’s been fast-tracked the rate of change in AJ’s weight is much greater than previous champions over their first 20 bouts. You can see this in the figure below. The steepest blue line represents the general trend of AJ’s weight gain. It’s steeper than the other lines because he’s gained the most weight since turning pro. When a heavyweight boxer becomes world champion, it’s quite reasonable for them to increase their body mass. In comparison to the other champions, AJ’s increase has been quite shallow, especially in comparison to Lennox Lewis who gained a lot of weight after he won his first world-title. The average increase in body mass for these four champions from debut weigh-in to career peak body mass is 24.8 lbs, very similar to AJ at 24 lbs (so far). (Excluding Riddick Bowe’s weigh-ins on comebacks in 2004, 2005 and 2008, following an eight-year period of inactivity). Thoughts on AJ’s body mass…. Due to his skill, the current opposition and his growing popularity, AJ has been fast-tracked to the pinnacle of the heavyweight division. He’s had to put on size at an increased rate in comparison to former champions. However, Joshua’s weight gain isn’t too dissimilar to the former champions and looks to have increased at a steadier rate. Obviously, we haven’t taken into account their opponents or any social factors that might influence the former champ’s weight but it does give us a nice picture for comparison. What do the punch stats say? Take a look at the punch stats of Joshua’s last nine fights in the graph below. The blue and orange bars represent the shots AJ landed and threw. Here we’re comparing them to the heavyweight mean-average punch stats (Compubox). From a visual perspective alone, AJ seemed to struggle with his fitness in fights against Dillian Whyte, Wladimir Klitschko and Carlos Takam. Lets break down each fight and look at the numbers. Joshua tipped the scales at 245 lbs for this heavyweight grudge match, that’s 4 lbs lighter than the fight previously (Cornish), so being ‘too big’ here would be a misconception. The graph above shows a much higher punch output during the Whyte fight (average thrown per round). In fact, Joshua threw 29% more than the average thrown per round. Unfortunately, we don’t have the data for round by round comparison. However, the fight was started frantically so it would be interesting to see how many punches were thrown in the first three rounds. A large volume of punches during this early stage might have compromised his performance in the subsequent rounds, but AJ managed to find his second wind and finish Whyte off in the seventh. This was a huge step up for Joshua, facing the heavyweight legend in just his 19th professional bout. AJ stepped on the scales at a (then) career heaviest 250 lbs; 10 lbs heavier than his Ukranian foe. Looking at the graph above, there isn’t anything that stands out in his average punches thrown per round. The graph above shows that AJ threw considerably more in the first half of the fight, in particular, the fifth round where he knocked down Klitschko. Following this epic round, he admittedly had a ‘few rounds off’ after getting knocked down himself in the sixth. He then stepped it up following ‘THAT’ uppercut and finished Klitschko with a stunning TKO. But as we delve even further, we notice clear differences in his power shot stats. Round 5 was an unbelievable three minutes of action. Joshua threw a massive 42 power shots, this is 33% higher than his average. 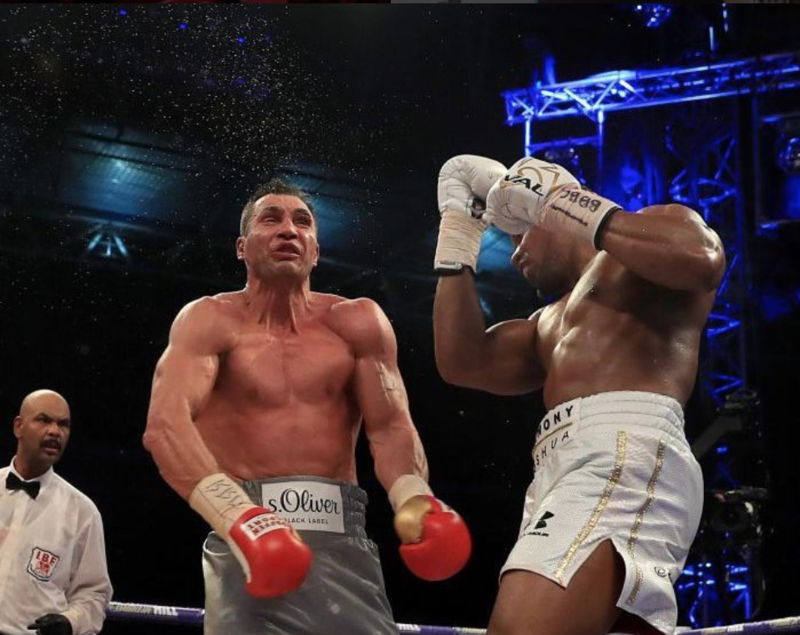 Klitschko, despite being knocked down, had success in this round landing 19 power shots. This was an amazing round that would take a lot out of any boxer. The Takam fight is where AJ has taken the most criticism about his fighting weight, recording a career heaviest 254 lbs. This seemed way too big to onlookers as he bore down on Takam who was 19 lbs lighter and 4 1/2 inches shorter. However, it should be noted that AJ was preparing for a 6″4 Pulev, that recently weighed in 1.5 lbs heavier (255.5 lbs) than AJ’s fighting weight. So in fairness to team Joshua, it was an understandable tactic to weigh in this heavy. Looking at the punch output, Joshua was a lot busier than previous fights, throwing at least 16% over his average rate between rounds 4 to 7 (peak in round 6 – 25% higher). These are often the rounds where boxers performance drops off. It’s a natural pacing strategy that occurs in all areas of life. From the punch stats, it looks like Joshua worked through the gears towards a high work-rate as opposed to the massive spike during the Klitschko fight. We think that Joshua’s punch stats bring out interesting results – something very actionable from a sports science perspective. AJ seems to struggle when he raises the intensity during a fight. From a tactical perspective, he’s shown that he’s adopted a pacing strategy against Takam, and worked at a higher work rate than he’s used to. The stand-out times when AJ looked tired were against Whyte and Klitschko when there was a huge spike in work rate – especially power shots in that epic fifth round at Wembley. Here we’ll explain the science behind why putting on muscle mass can be challenging for boxers and combat athletes from a fitness and strength perspective. Why can size be an issue for fitness? When an athlete increases in body mass, whatever composition (amount and type of lean tissue, fat, water), it will increase their energy expenditure. Each shot thrown, every head slip and foot defence will require relatively more energy to perform. In heavyweight boxing, a large proportion of actions are forceful whole body movements requiring significant amounts of energy. This energy comes from short-term energy systems and predominantly aerobic energy systems that require oxygen. Most modern-day heavyweight’s will have a good sized engine, but this engine needs to keep up with an increase in size to match new energy demands. We know that rapid adaptations occur in muscle within 2 to 3 weeks using sprint interval training – but these changes would unlikely be great enough to cope with new energy demands. Plus these adaptative signals for improved energy production would be competing with adaptive signals for muscle hypertrophy likely dampening responses for either one, the other, or both. It’s also only changing one part of the equation that determines aerobic metabolism. The second way to improve the capability of the aerobic energy system is to change the amount of oxygen-rich blood delivered to the muscle tissue and returned the heart. Let’s say our boxers aerobic capacity is 5.5 L/min. At 115 kg his relative oxygen uptake is 48 ml/kg/min. And let’s assume that his fitness has stayed the same since he turned pro but his weight has increased. His relative oxygen uptake is 53 ml/kg/min when he turned pro at 104 kg. His ability to use oxygen for energy production would be relatively less. What methods can we use to condition the big guys? In part, it depends on the time-frame available to make sufficient changes, the fight-plan and any changes in body mass (up or down). But the key is trying to compliment an explosive all-action style. It’s a heavyweights strength, and we’d look to make it a super strength by enabling his conditioning to support this style. All our conditioning is performed at a high-intensity, so it’s a given that our recommendations would include high-intensity intervals. But there’s also an element of dealing with the forces produced. When you’re over 210 lbs in bodyweight, no matter how strong you might be, the impact of any running, slow or fast, whether on the road or track or trail is not going to be kind on your body, especially when training load is high. If there’s any muscle, tendon or ligament issues, limited mobility or relatively poor mechanics around the ankle, knee and hip then it’s possible that problems might occur earlier and with a more rapid onset in a heavyweight. Let’s not forget almost every boxer we’ve tested has the same general movement issues with their ankles, hips and knees caused by hours of boxing specific training. So how would we include high-intensity intervals at a sufficient intensity while limiting impact forces? We have 2 very useful pieces of kit. First, is our Woodway Curve treadmill, which is our preferred conditioning mode. It’s an excellent tool for sprint interval and high-intensity interval training – our boxer’s have a love-hate relationship with it. When we combine it with our carefully selected conditioning plans this treadmill gets athletes fit and fast. Plus we’ve never had any complaints about soreness or impact injury. Secondly, we have an altitude tent. But we don’t use altitude in the way you might think we would. Traditionally athletes go to altitude to increase their capability transport oxygen to their muscles by increasing their volume of red blood cells. To do this requires 2 to 3 weeks (if you’re a responder) of living at high altitude. We use altitude to make our conditioning sessions even harder, and crucially that enables us to meet our goal of reducing the impact forces associated with high-intensity training even further. Because oxygen is reduced in the tent from 21% to 15% it means there’s not enough oxygen to support energy production, therefore speed, and the forces associated with running at high speeds have to decrease. But because we prescribe our sessions based mainly on perception of exertion (usually 9 or 10/10 exertion) our boxers are still working very hard which still requires support from aerobic metabolism as well as cardiovascular and ventilatory function. So forces are reduced, this decreases mechanical strain BUT cardiovascular and ventilatory demands remain similar to, if not greater than, the session without the simulated altitude. So we can get the stimulus we want to improve conditioning but save the legs from undue strain by decreasing the intensity and the duration of running (compared to road running for example). Another positive aspect of this type of training is that it’s mentally challenging. These sessions are the ones that athletes have to prepare for in their minds a few days before. There’s nothing like this – high-intensity intervals on the curve are hard enough – but with the addition of altitude it takes the session to another level. Our boxer’s say time and time again that the most mentally challenging sessions are the ones they’ve done in the tent. Which clearly has a beneficial cross-over to the times they’re challenged in the ring. Overtime we’d also increase the amount of work a boxer would do outside the tent, to introduce more speed and high-force activity into his training. How can size affect the punch? A forceful punch is dependent of how much momentum you can create. This is related to how quickly we can move mass towards the target (e.g. Punching arm/fist to face). Heavyweights with fast hands hit so hard because they generate a lot of force and momentum. That’s why AJ is a devastating puncher – knocking out ALL of his professional foes. If a boxer increases body mass, they will need to produce high rates of force development to make sure they move just as quick. Boxers are at risk of slowing down if they move up weight by putting muscle bulk on like a bodybuilder. A boxer putting on mass needs to focus on neuromuscular adaptations to develop a neuromuscular system with the capability to generate force rapidly. To achieve this, we focus on strength-speed exercises to increase speed when increasing body mass…..
Strength-Speed (sometimes referred to as explosive strength) is a classification of strength where athletes are required to produce large magnitudes of force in a short timeframe. The aim is to optimise the rate of force development. We use relatively high intensities within this zone (70-85% of 1RM), keeping the focus more on the strength aspect rather than speed – hence the term ‘Strength’-Speed. These are the ‘gold’ standard in developing explosive strength, as it teaches you to perform “explosive” movements, activating several muscles & joints in the process. This has a large transfer to any sport that involves running, jumping, throwing or striking movements. It also promotes rapid kinetic chain sequencing, which again is important for any sport. For example, a punch in boxing whereby force is generated from the lower body and hips, through the core then into the upper body for a knockout punch. 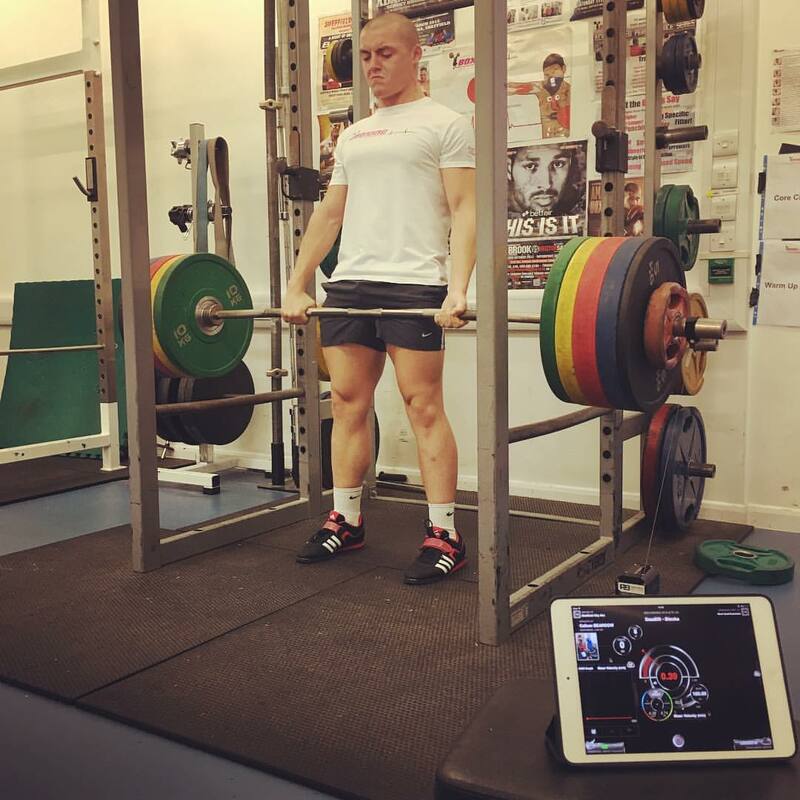 The techniques are much easier to learn therefore an athlete is more likely to be loaded heavier and produce more force through the lifts, and increasing the likelihood of explosive strength gains! Velocity Based Training (VBT) is a method whereby the speed of a lift is used to monitor performance and structure programs. It’s often used in strength and conditioning for improving strength and speed. Data is collected using accelerometers or linear position transducers that feedback how fast an athlete is performing each repetition. We use the GymAware at Boxing Science, but we also recognise the PUSH band as a reliable monitoring tool. It all comes down to rate of force development (RFD). This refers to the speed at which we produce force. What we’re wanting to achieve is peak RFD. This has shown to be achieved more at loads of 70-85% 1RM rather than 50% or less and relates to our strength-speed training. Increasing the RFD whilst simultaneously reducing the time to peak RFD, will result in a left and upward shift in the force-time curve. This shift equates to improved explosiveness. High force development is critical, especially with heavier boxers. We can relate this to relative mass, requiring athletes to shift increased levels of body mass at high speeds. This is critical for the heavyweight boxer! Maximal strength training is achieved with loads 85%+ of our 1RM. Whilst max strength training sessions should be included in a well-rounded strength programme, there are disadvantages to this type of training in boxing. For example, boxing is a weight category sport, where athletes are required to be as strong as possible whilst keeping body mass levels down. Max strength training promotes hypertrophy, which will result in increased body mass may slow down boxers when performing skills training, sparring and competitions. Furthermore, training with increased loads can result in neural and muscular fatigue, which can be detrimental to an athlete’s recovery during high training loads. There is always the risk that heavier weights will develop slower grinding type movements, which might have an adverse effect on things such as hand speed. Nevertheless, we are simply comparing the effects of maximal strength training in comparison to strength-speed. In no way are we disregarding max strength training as a training parameter for boxers. Why Keep Developing Strength and Absolute Speed? We do this to create a shift in the time-force curve. The left and upwards shift in the curve relates to an increase in force production and therefore, an increase in RFD. What we want to do is keep developing force and then transfer this to speed. To put this into a sporting context, we can transfer this over to a cross in boxing. If we were to increase our upper body strength, we want to keep the shots quick and explosive for them to be effective. AJ has increased his weight rapidly over his 20 professional fights – because he’s had to. We’ve shown that his weight gain is accelerated but not unusual when compared to former champions and it’s clearly the right thing to do.